International Museum of Astronomy: Emulating one of the best scientific methods of learning about the cosmos, spectroscopy and spectograph charts - which plot perceived light wavelengths for astronomical studies - a long axis nestles perpendicularly into the sloping landscape. white. It provides structure for the museum program and a filter to the light glow from San Pedro de Atacama, functioning internally as a 2-story circulation hub for the museum employees. The visible part of the light spectra is represented by the museum atrium. It pierces the axis providing a readily perceived entrance with an unobstructed and transparent character space, where light has the main role. The non-visible part of the light spectra is materialized by the planetarium, exhibition halls, auditorium, offices, support, and restaurant blocks, with a semi-autonomous and enclosed character. 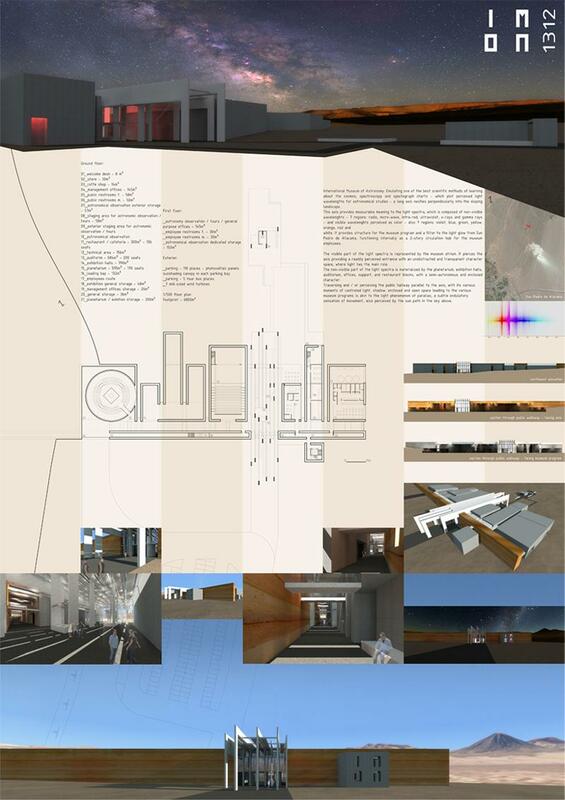 Traversing and / or perceiving the public hallway parallel to the axis, with its various moments of controled light, shadow, enclosed and open space leading to the various museum programs is akin to the light phenomenon of parallax, a subtle ondulatory sensation of movement, also perceived by the sun path in the sky above.